Margarita Real Estate, Immobilien auf der Isla Margarita. Bienes Raíces en Margarita. 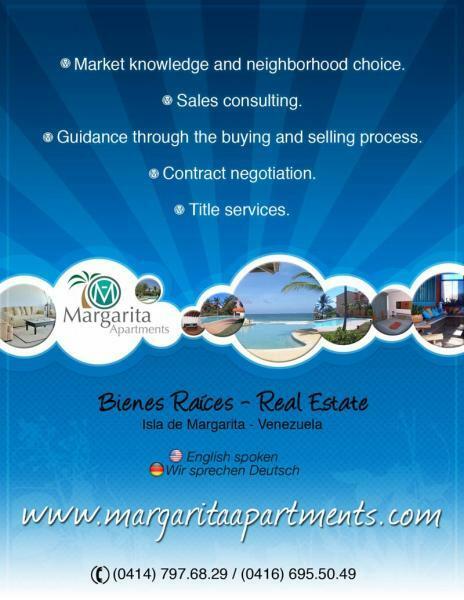 Please feel free to call Marina Febres at +58 414 7976829 or email us at marina@margaritaapartments.com. We will reply in a timely fashion. You can write in English, Deutsch or Español. If you have not received an answer to your inquiry, please do email us again at: marina_kallabis@hotmail.com. If you are on Isla Margarita, do not hesitate to give us a call. A viewing can be arranged, provided you call us well in advance. Just tell us what kind of property would suit you. From Isla Margarita dial 04147976829. Your feedback is very important to us. Comments and questions are most welcome. Our aim is to help you find a suitable property and make the best of your investment. No dude en llamarme al 0414 7976829, o contácteme via correo electrónico: marina@margaritaapartments.com. Le responderé a la brevedad posible. Su atención es muy importante para nosotros, por lo cual le invitamos a realizar cualquier pregunta o comentario. Deseamos ayudarle a encontrar una propiedad adecuada a sus necesidades y maximizar su inversión. Beach Front in the best building of the area ! Bellísimo Apartamento frente al mar en el mejor edificio de la zona !